Need better rankings in Google? We can set up your ads so that you rank on the first page for your selected keywords. Google don’t charge you anything to be there – they will charge your account only when someone clicks your ad and visits your website. Google AdWords: How much would you pay for each new lead? Say a “click” costs you $2. And every 10th person who visits after clicking your ad sends an enquiry. In simple terms, that lead just cost you $20. These numbers will be different for each industry and website – but this simple equation is what it all boils down to. What other form of advertising is that simple and that accountable? Take another look at the screenshots above. We can get you right in front of your customers – whether they’re at the desk or on their phone. Either way – they are looking for you. Will they find you? Google will charge you directly for your actual clicks, but you can set a budget in advance and change it at any time. Where do you go when you’re looking to find out something? 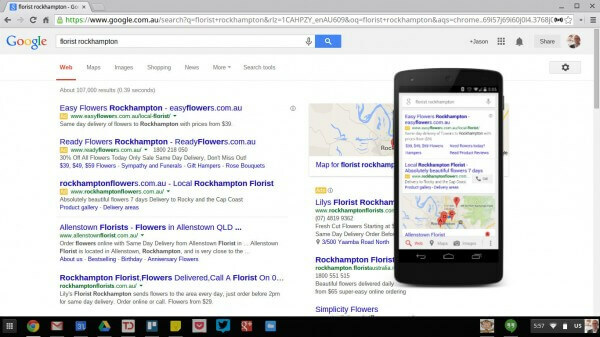 Google dominates the Australian search landscape. You need to be found here. We can make it happen. Contact us now.